One of the great fears of score collectors is the prospect of a beloved score never receiving a full release. While for the majority of Hollywood blockbusters this is not a problem, films that experience a more limited release combined with a language other than English face significant hurdles to see their scores released. 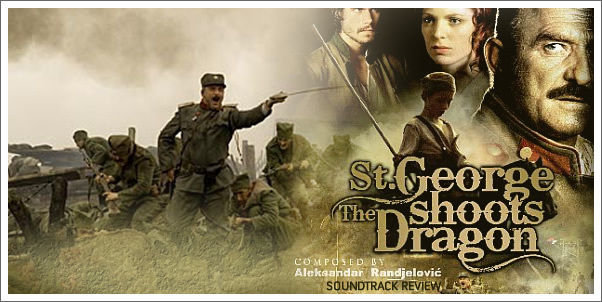 So it comes with refreshing relief that KEEP MOVING RECORDS has taken the admirable step of releasing such scores to audiences, in this case the Serbian film ST. GEORGE SHOOTS THE DRAGON, directed by SRDAN DRAGOJEVIC. Rather than telling the mythical tale of the saint’s duel with the fire-breathing beast, ST. GEORGE SHOOTS THE DRAGON narrates the story of a small village amidst constant warfare between the years of the Balkan War and World War I. What is most striking about Randjelovic’s score is the distinct lack of diversity heard throughout. This is exemplified right off the bat in “Opening Titles”, an entirely string based piece that introduces the mournful descending theme of the film. The desired effect of a largely somber tone is achieved, but this can’t hide the fact that this tone fails to evolve or change in any way for the entire duration of the score, even in the final track “Battle”, a score that has disturbingly little “battle” music to back up the title. If you find yourself skipping the first track, it is likely you will little that will hold your attention as you venture further into the soundtrack.